Dindigul Dragons are all set to take on VB Kanchi Veerans on Sunday, July 22, 2018. DIN has won 2 matches out of 3 and VBK has lost the matches they played so far. In Today’s Dream11 Fantasy Cricket Match of DIN vs VBK 12th T20, TNPL, we will cover Probable Playing 11, Fantasy Cricket News, Toss Prediction, Pitch Report of NPR College Ground, Dindigul and Who Will Win? Who Will Win the 12th T20 Match, Between DIN vs VBK and Toss Prediction? Where Can You Watch the Live Streaming of DIN vs VBK, 12th T20I or Channels to Watch? Dindigul Dragons have shown their intention by winning back to back matches while VB Kanchi Veerans didn’t had a great start. They lost both the matches and yet to prove their worth. According to our astrology prediction, DIN will win. The team winning the toss should opt to bowl first as chasing will be easy on this ground. According to our astrology prediction, DIN will win the toss and ask VBK to bat first. Date: The match will be played on the 22nd of July 2018 (Sunday). Match: Tamil Nadu Premier League, 2018, DDD vs VKV, 11th Match. Venue: Dindigul, NPR College Ground. The pitch will behave the same as it behaved in the first match of the day. In short, it will be a batting friendly pitch and the bowlers will have to struggle to take wickets. The bowlers can only take wicket if they bowl in right line and length. Note: If you know how the pitch will play, then you can select your team according to the pitch. Make use of the pitch while selecting your team for fantasy leagues. From the above pitch report, you would have understood that making a team which is a combination of batsmen would be a wise choice. It is expected to be partly cloudy throughout the day. The cricket fans and fantasy users can see the complete game as no rain is expected. It is expected to be a hot and humid day. The temperature is expected to be 30-Degree Celsius and the humidity to be 52%, which may rise up to 62%. 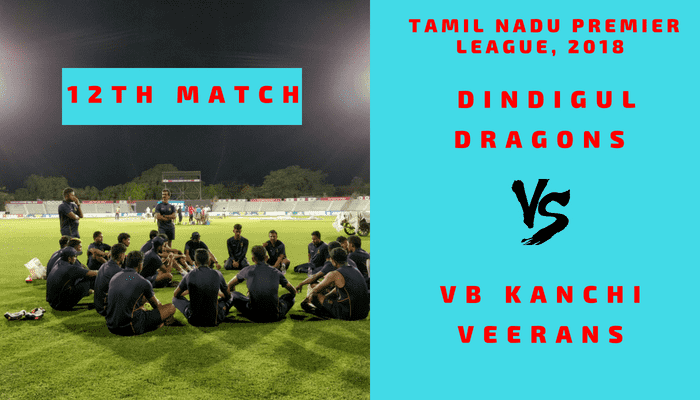 Dindigul Dragons and VB Kanchi Veerans faced each twice in TNPL and both the teams have one-one match each. In the last encounter, VBK defeated DIN by 5 wickets with 31 balls remaining. N Jagadeesan, Hari Nishanth, R Vivek and NS Chaturved are the key performers of Dindigul Dragons. Ravichandran Ashwin will not be available for the remaining matches as he is about to join India team. Jagadeesan will lead the side. N Jagadeesan (wk), Hari Nishanth, Ramalingam Rohit, Balchander Anirudh, R Vivek, NS Chaturved, M Mohammed, Adithya Arun, Mohan Abhinav, Trilok Nag, Jagannathan Kaushik. Ravichandran Ashwin (c), M Sujendran, Adithya Arun, Mohan Abhinav, Varun Totadri, N Jagadeesan (wk), Trilok Nag, Hari Nishanth, ME Yazh Arun Mozhi, NS Chaturved, Ra Aravind, Balchander Anirudh, N Ramakrishnan, R Vivek, M Mohammed, Jagannathan Kaushik, Nivethan Radhakrishnan, Ramalingam Rohit, M Silambarasan. K Vishal Vaidhya, V Subramania Siva and Baba Aparajith are the key performers of VB Kanchi Veerans Team. The same team is expected to play. Aushik Srinivas, R Silambarasan, Baba Aparajith (c), S Siddharth, V Subramania Siva, Sanjay Yadav, S Ashwath, K Vishal Vaidhya, U Mukilesh, Suresh Lokeshwar (wk), Sunil Sam. Suresh Lokeshwar (wk), S Arun, Baba Aparajith (c), C Shriram, Aushik Srinivas, P Francis Rokins, K Vishal Vaidhya, RS Mokit Hariharan, S Siddharth, R Divakar, U Mukilesh, Sunil Sam, V Subramania Siva, K Deeban Lingesh, Sanjay Yadav, S Chandrashekar, S Ashwath, U Vishal, R Silambarasan. Conclusion: This is it for Today’s Dream11 Fantasy Cricket Match Prediction of DIN vs VBK, 12th T20I Match, which will be played on Sunday 22nd July. We have covered all the details required to win any fantasy leagues. We have covered players recent and past performance, dream11 guru and crictom prediction, all the latest news and updates of Dindigul Dragons Team and VB Kanchi Veerans Team, weather report of Dindigul, dream 11 best teams, keys players, the best choice for captain and vice-captain, where to watch the live match of DIN vs VBK, 12th T20 Match and the details of live streaming of Tamil Nadu Premier League (TNPL), 2018.